The answer of above question is None. Every one of us is using Google every day. We all know that Google is the most popular Search Engine in today’s world. As we know that Google not just limited to Search Engine but It is providing various services also. Today, we are going to see the service from Google which may not be known to you. Yes, I am talking about Google Domains here. Google Domains is a lesser known service from Google. With Google Domains, you can clam and register the domain for your website. Let’s just take some quick introduction about Google Domains. Google Domains is a domain name registrar which is owned and managed by Google. Google have started this service in 2014 and it is still in Beta Stage. Google Domains is a strictly a domain name registrar only. It is not offering any complementary services such as hosting. The Goal of Google with Google Domains is to provide the simplest way for small businesses to come online. When you buy Google Domains, you don’t need to buy privacy protection. It will come Free with Domain. Other companies are charging extra money if you want protection. You can easily integrate your domain with most popular website builders. It is very easy and fast. So you can start your website once you buy Google Domain. With Google Domain, you can create your professional email address easily. You just need to use G Suite with Google Domain to create professional looking mail address of yours. In today’s time, new extensions are coming like .guru, .desi etc. Google Domains are constantly working to provide you more and more domain extensions. 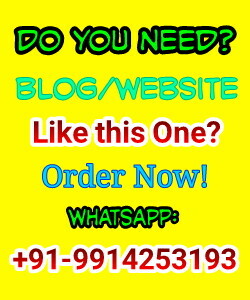 With Google Domains you can easily create sub domains like blog.example.com. You can create up to 100 such sub domains. You can create up to 100 domain allies and then you can use them to forward emails to your main email address. As we know that Google is well known for its design and simplicity. The Interface of Google Domain and backend are very simple and minimalistic. They focus on only one thing and that is domains. The interface is clean and nice. Google Domains can easily integrate with other apps. You can integrate them with Google Apps to create the professional email account or you can integrate them with your favorite website builders. Website Builders can be any popular website builder like WordPress, Blogger or Weebly. Here is the Complete Video Guide on "How to Create a Blogger blog from Scratch"
Google is known for its simplicity. You just need to give a single click to point your domain towards your hosting. How simple it is...!!! Google maintains single cost for each top level domain. Unlike NameCheap or Godaddy, Google does not provide the discount on domain names. But when you buy the domain from Google, privacy protection will be free. So it is value for money. As Google Domains is a service of Google, you can expect a quick support system for all their users. Google Domains support system is very good. You can get your queries solved in a couple of minutes only. Google do not provide any other service with Google Domains. So if you want to add SSL to your website then you need to buy it from the 3rd party. But buying SSL from the 3rd party and integrate it with your domain is hard. With Google, you cannot buy country specific TLDs which is quite a big limitation for you if you are running any company. After 3+ years also Google Domains is in Beta Stage. Google is saying that it is long term project of them. So we don’t need to worry much but there are several projects which Google is shutting down periodically. So we may need to consider this thing seriously. Google Domains pricing is not lowest in the market but you will get quality with them. Google is not providing any discount on the domain names like Godaddy and Namecheap. You will get the price benefit when you repeatedly buy the domain from Google Domains because with Google Domains, you don’t need to pay increased price each year. Each TLD is having its fixed price which you need to pay. This is the big advantage because, in Godaddy, the first year prices are very low but domain renewal prices are very high. 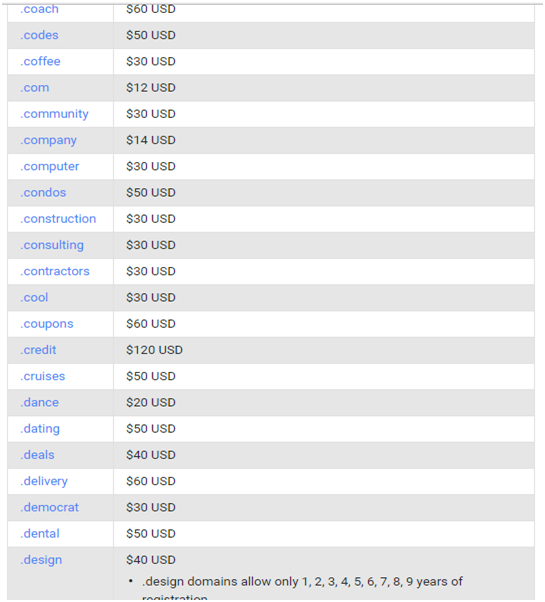 Check the below image to see the price of some of the TLDs from Google Domains. Google Domains are suitable for small businesses. If you are having a small business or small website then you can defiantly try Google Domains. You will get very simple and easy to use interface, quick support, free privacy protection and lot more. If your requirements are complex then Google Domains will not be able to fulfill them. You should go for other companies. Are you using Google Domains? Share your Experience with Google Domains via Comment Box. Message: I hope that you have enjoyed 'Google Domains Review: All You Need to Know About Domains.Google' article on Tips2secure. However, if you want me to deliver more items, then please share my post. You can use Social Sharing Widget provided at the end of every post. After all, Sharing is Caring!